A stroke is brain damage that occurs as a result of an interruption in blood supply to a portion of the brain. This happens as the result of either blockage of a blood vessel or bleeding of a blood vessel in the brain. A stroke is usually named by the injured part of the brain or by the blocked blood vessel. A middle cerebral artery (MCA) stroke is one of the most widely recognized large vessel strokes. What Is a Middle Cerebral Artery Stroke? An MCA stroke is an interruption of blood flow to the areas of the brain that receive blood through the middle cerebral artery. These regions include the parietal lobe, the temporal lobe, and the internal capsule and thalamus. If the whole entire middle cerebral artery is blocked, then the result is a large vessel stroke that affects the whole entire middle cerebral artery territory- which is every region of the brain that receives blood through the middle cerebral artery. An MCA stroke causes a language deficit, weakness on the opposite side of the body, a sensory deficit on the opposite side of the body and vision defects. If only a small branch of the middle cerebral artery is blocked, then a small vessel stroke results, impacting a small section of the middle cerebral artery territory. This is often less serious. Why Does a Middle Cerebral Artery Stroke Occur? MCA strokes are generally embolic as opposed to thrombotic. This means that usually a middle cerebral artery stroke is caused by a blood clot that traveled from elsewhere in the body, typically from the heart or from the carotid artery, and lodged in the middle cerebral artery, blocking blood flow. There are a number of risk factors for MCA stroke, including heart disease, carotid artery disease and the risk factors that can cause a stroke in any location in the brain, such as high cholesterol, hypertension, and diabetes. Where Are the Middle Cerebral Arteries? There are two middle cerebral arteries: the right middle cerebral artery and the left middle cerebral artery. The right and left middle cerebral arteries are vital blood vessels that branch off from the right and left internal carotid artery. Each internal carotid artery is a branch of either the right or left common carotid artery, which are large blood vessels located on each side of the neck. The right and left common carotid arteries are normally mirror images of each other, and each common carotid artery divides into an external carotid artery and an internal carotid artery. Then, within the skill, the internal carotid artery further divides into several arteries that supply blood to the brain, the largest of which is the middle cerebral artery. The left and right middle cerebral arteries each supply a significant portion of the brain with oxygen-rich and nutrient-rich blood. What Does the Middle Cerebral Artery Do? 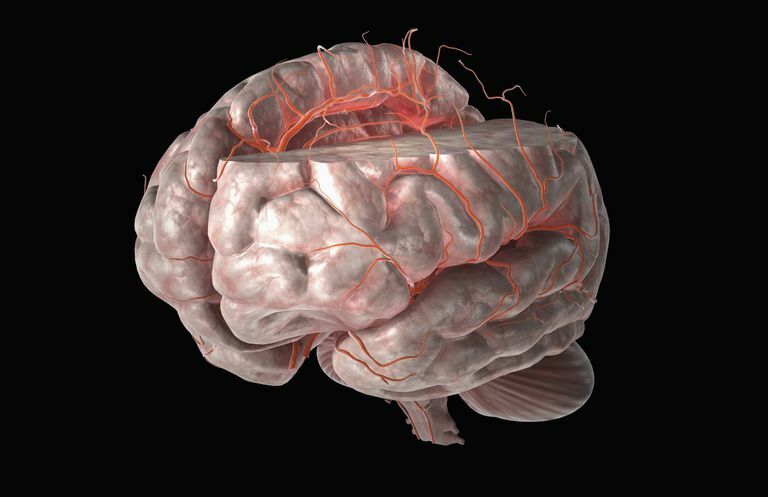 Arteries in the brain carry blood to deliver oxygen and nutrients to the brain. The different arteries are structured like pipelines that travel to different regions of the brain. Each artery supplies a different section of the brain. A section of the brain that receives blood from a particular artery is referred to as the 'territory' of that artery. The middle cerebral arteries supply a large territory in the brain which includes the temporal lobe, the parietal lobe, the internal capsule, the thalamus and a portion of the frontal lobe. Therefore, if blood flow in the middle cerebral artery is impaired, the jobs that are normally carried out by these areas of the brain become compromised. An MCA stroke is among the most easily recognized types of stroke, and you may also need to have brain imaging studies to confirm the diagnosis. Because an MCA stroke may be a large stroke, the short-term situation is handled with the utmost care. Some people who experience an MCA stroke are candidates for urgent treatment with TPA or blood thinners, while others may need careful fluid management and close observation. If you or a loved one has experienced an MCA stroke, then your recovery may take some time, particularly if the whole entire MCA was blocked, resulting in a large stroke. Long-term recovery and rehabilitation may take months or even years. However, even very serious strokes can result in good recovery, and most people who experience MCA strokes are able to regain some or all function after the stroke. Impact of MCA stenosis on the early outcome in acute ischemic stroke patients, Taiwan Stroke Registry Investigators, PLoS One. 2017 Apr 7;12(4):e0175434. doi: 10.1371/journal.pone.0175434. eCollection 2017.